Website and processes: 5 Oct 16 Stewpot, 4/5 Good "wanted to order two vouchers. had to go through the system twice, otherwise very good"
Why make difficult decisions when with this you can have the best of both worlds and experience fixed wing and rotary flight. Experience includes a full 30 minute flight in both a R22 helicopter and a Cessna 172 Light Aircraft. Take control of our Robinson 2 seater helicopter. Firstly you will have a safety briefing and then a more technical briefing with one of our experienced pilots who will teach you the basics of how a helicopter works, which controls do what and how to carry out some basic turns climbs and landing profiles etc. Once this is done you will go out to the aircraft, jump-in and go flying!!! Once in the air your instructor will bring you onto the controls giving you full control of the aircraft, but need to worry he will be there to keep you right and also should you not wish to fly you do not have to. Be sure to bring your camera to capture the amazing sights you will see whilst in the air. On return to the airport your instructor will debrief you on your flight and tell you how you could improve and what went well to put a smile on your face a truly memorable day for all the family. A once in a lifetime experience. 30 min flight over the beautiful scenery of the Ards Penninsula, or choose your own destination!!! Fly over your own home and take an photo or wave to a family member in the garden,the choice is yours!! Your air experience starts with a briefing from one of our instructors. After take-off you will have the opportunity to take control of the aircraft (Cessna 172) and enjoy the sensation of flying whilst sampling some of the most breath-taking scenery in the British Isles. We offer the opportunity for you to bring two other persons on your flight. NOT SUITABLE FOR EPILEPTICS OR PERSONS WITH SERIOUS HEART CONDITIONS. Helicopter - Maximum weight 17 stone. 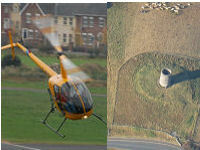 Helicopter flights available second and last Saturday of the month. Flights can be taken on separate days. Please book at least one month in advance if wanting to do the two on the same day.